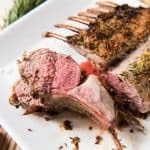 This Rosemary & Garlic Oven Roasted Rack of Lamb is a perfect centerpiece for an elegant holiday dinner without requiring any fussy or difficult skills! Juicy, tender, and perfectly cooked to a medium-rare with a crusty exterior made with garlic, herbs, and lemon zest, this is one of the best cuts of lamb and makes an easy and impressive main dish for entertaining! Heat oven to 450 degrees F. Place the lamb with the fat side up on the baking sheet and roast for 15 minutes before rotating the baking sheet to ensure even cooking and roasting for another 10 minutes for medium-rare meat or 15 minutes for medium doneness (although in my opinion, lamb should is best served medium-rare). Transfer the roasted rack of lamb to a cutting board and allow to rest for 10 minutes so the juices can redistribute before slicing into individual chops for serving. Use a sharp knife to slice between the bones, then serve immediately. Alternatively, you can seal in a ziploc bag and return to the fridge to marinate for up to a day. If refrigerating, be sure to allow the lamb to sit outside of the fridge for an hour to come up to room temperature before roasting. When roasting meat in the oven, it's very important that the temperature be correct to help gauge cooking times. If the oven is too warm or too cool, it can make a big difference in the doneness of the meat. A simple oven thermometer can help you check to be sure your oven temperature is running true.